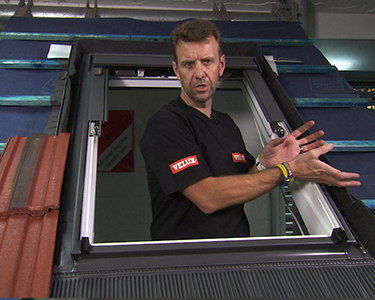 In this five-part guide, we take you through the full installation of a Velux GGU Centre Pivot Integra Roof Window onto an interlocking tile roof using a Velux EDW Flashing Kit and a BDX Insulation Collar. 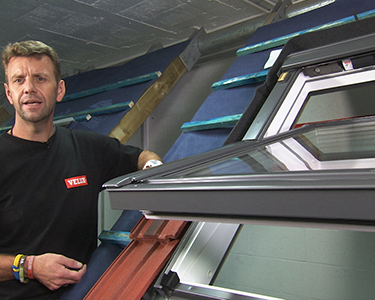 In Part 4, Mark takes you through the full installation of the Velux EDW Flashing Kit, this kit allows the installation of the Velux Roof Window on an Interlocking Tile Roof (Redland 49s). 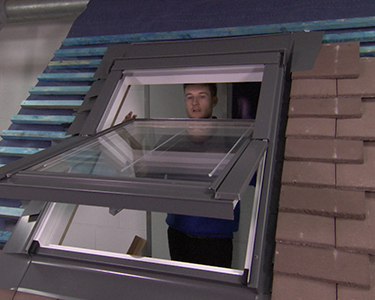 In this part you can see how the flashing kit works with the tiles to create a waterproof seal around the window. 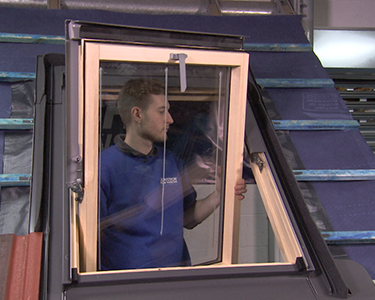 In Part 5 you’ll see how to set up the window so it’s ready to be controlled remotely. Now, the final part of the installation to make everything weather tight, we have our box of external flashings and claddings. You can see again, that consistency with the coding on the carton labels. The first line being (as it was with the window) a basic description of the type of flashings. So you can see with this illustration here, it’s giving you an idea of the type of roof material and the thicknesses of the materials that the flashings can work with. Notice again, we have that key reference point of our red square. So we know this is a flashing for a standard installation height, following that red line principle of where we positioned our brackets earlier. Here again, we have the frame size of the window covered again in centimetres here so we know this is the right size of flashing for the size of our window. And as before, we have our QR code. So if we scanned here, on this particular QR code, you get a complete five or so minute installation run-through of everything that we’ve covered up to now, plus the installations of the flashings as well. So it’s the full installation but as an animation itself. Following the theme of the no requirement of the knife, and similar to the opening mechanism that we have for the felt collars, we have our two tab system here. So it’s just lift the tab and pull that one away, and then lift this one and do the same. Now, we just have to fold the main lid back one side at a time and we’ll see the flashings themselves. So in here, we have all of the component parts that you’re going to need to complete the installation. So to begin with, we fit the bottom apron. Now, you’ll see from the instructions, all of the parts that you’re going to fit are all numbered from one to seven. And to just make life a little easier to identify, you can also see that stamped on the back of each of the individual parts. So again, all designed to make it as straightforward as possible to get the sequencing correct. So initially, because we have a profiled tile, we need to just position the apron immediately below the window and then start to just mould the flexible apron into the shape of the profile itself. This is important for a little later on, when you then want to make sure that the apron itself is in as tight a contact with the roof material as possible. Obviously, if you have a flat tile, you don’t really have to worry about doing this section but you would still do the following section beyond this. Because now we want to just try and close this gap off as much as we can, so to do that, we want to just bend the apron so that it has a slight bend down towards the tile. So the easiest way to do that is to lift the apron up, rest it against the tiles themselves and then just pull the aluminium back a fraction. It doesn’t have to be a huge angle. All we’re doing is we’re just changing the angle now so that the bottom apron is basically rubbing off the tiles. Now when that sits down, it’s a little closer to the tile and will be completely dressed in at the end with a soft rubber mallet. To hold this in place, you need the bottom frame cover which is part number two. Now, this part will initially hold itself in position to enable you to reach to get the screws and that’s through the use of these small little nodules here that are going to plug into this part of the window. So with that plugged in, I can now confidently jump down here to get my screws, knowing my flashings aren’t going to shoot off the roof. So in here, we have a double bag. On this side, you have the installation screws. Notice again, how they are the same sort of colour grey as the flashing so everything blends in. On this side, we have some small tabs and tacks which we’ll see later on when it comes to securing the side flashings. So we’ll put these away just now because all we need are the screws. So to begin with, we want to secure the large bracket on either side. And then just work your way along the window, being careful not to over-tighten the screws because this is aluminium so if we over-tighten, we’re going to start to basically force its way all the way through if you do go too far. So next, we’re going to protect the side of the window, so we have our side flashings, again shown with the number three on the back to correspond with the instructions. Notice also when you look at the side flashing, how we have the foam here which stops short at one end. This is to indicate where the top of the flashing actually goes. So again, just so you know your left and right reference. The section where the foam stops should always be at the head of the window. So the side flashing is just going to sit over this ridge and then tuck inside this fold on the aluminium. And then we’ll slide it down until it hits this double ridge and the foam comes into close contact with each other. To initially bond the two sections together, we just fold this little tab over and pinch that in like so. We also have the clips and the nails that we mentioned earlier, so if you wanted to ensure that nothing could move, so again, if you aren’t going to have this tiled tonight, or you were going to maybe end up with a small cut tile and you want everything to sit nice and flat… So to help secure the side flashings to the roof, especially if it’s going to potentially get a little windy overnight and you aren’t going to be able to get this tiled today or if you were going to end up unfortunately, with a fairly small cut and you wanted to make sure that the flashings didn’t start to make the tile kick up then we have these small clips that we mentioned earlier. So to fix these, you hook that end over the upright of the flashing itself, bend that into place and then just with the tack, knock that into the batons. And then just carry on your way up each side to fully secure both sides of the flashings themselves. And do this on both sides. Having fitted both side flashings, we now need to cover over the side flashings with our next component part. But before we can fit those, we need to do a little bit of preparation work in the means of removing this cladding section here so that we can then cover that over afterwards. Now, to release these cladding parts, there is just a simple little light grey release button here, just at the top of the hinge. Pop that in with your finger and that allows you to just lift that off at the bottom. Once that’s free, slide that down and then pop that somewhere secure as you’re going to pop that back onto the window in a minute. Come onto this side and do exactly the same. Push the little button in, lift this section up and because we have the rain sensor attached to the top here, we’re limited as to where we can place it so for this one, we’ll just pop it outside and then pop that back on in a minute. Having removed both top cladding sections, we’re now able to fit the side frame covers which as you can see here, are number four, following that simple numerical sequence. So we just break open the polythene to remove the parts. And then as before, we can identify which is the top end, but this time it’s with this light grey tab. So when you’re working out which is left or right, that’s your reference point. This tab should always be at the top of the window. Now, how this secures to the window initially is through these two folds in the aluminium which are going to engage into the two clips at the bottom of that large side bracket. So the easiest way to do this is just to rest the flashing on the window so that it just pops underneath this top cover. And then as you slide this up, push it in towards the middle of the window as you push up and that guarantees you’ll engage both brackets. With both of these now clipped into place, we can take our top cladding part and fix that back into place. So all we do is take this little rebated section here and slide that back underneath this plastic cover here. That in turn, will align the clip to the fixing point in the hinge and as you push down, you will hear a satisfying click so you know it’s in place and then we’re just going to do the same on the other side. So having reattached both top cladding parts, we now need to cover over across the top of the window and cover over the motor. And to do that, we have part number six. Now, if you remember back to the opening up of the window, this was the additional box that came inside the window. It’s the only part of this installation section that doesn’t come inside the flashing box. So it’s important that we look after this box. To get into it, we just peel this tab back and just pull along and do the same on the other side. As we open the box up, you can see inside the top cover with its own individual bag of screws for these parts. So just now, I’m going to pop this above the window while I prepare this cable for installation. Now, before we fit this hood section, you can see we have the cable running from the rain sensor inside this little bag to keep everything nice and dry during installation. As we need to tuck this cable and keep it out of the way and make sure it doesn’t get pinched by any of the screws, you’ll find it generally easier to just remove it from the bag and then as we install the hood, we can tuck that cable neatly out of the way without fear of it being pinched or becoming visible inside. So with the bag removed, we can take our hood section which is going to rest across here and just rest inside that little recess. So once we have it lined up into position, we can just keep an eye on the cable as we bring that down into position there, making sure that none of the cables are caught and then we’re ready to secure this to the window. So with the screw in position, we’re just going to tighten that up and then come over and do the same on this side. And any excess cable can just be tucked up inside the hood section so as I say, none of it is visible from inside and everything is nice and neat, tucked into this little rebate here. We are now ready for the final piece of flashing which is going to sit around this top section and overlap this side flashing. So as you can see from here, the final part of the seven pieces is part number seven and the key thing to linking these in place is that you see that we have this tab that we referred to previously. This tab is going to have to go in through this little slot on the side. So if you tip the top flashing up a little bit as you install it, it makes it a lot easier to just guide that tab through the slot first time and then once you have everything into position, you can just push that down and it will all click into place. On the sides here, we’ll just clip these together again so that’s nice and tight, and then pop another tab in there and do the same on the opposite side. Finally, to hold that in place, we just bend this tab over and that’s everything secured. Now, the last thing we need to do before we install the sash is to remove this cover from the rain sensor. This little red cover here is purely to protect the rain sensor during the installation process. Failure to remove this will basically stop the rain sensor from ever getting wet, which means it won’t be able to close the window if it starts raining. It may sound like a silly thing but they are the silly mistakes that can be made. So now all the flashings and claddings are on we need to start trimming the foam back so that we can get our tiles to sit nice and flat, and neatly supported by the foam underneath. So as you can see on this particular tile, because it’s going to come to rest on the flashings, you’ll have to remove the nib that’s nearest to the window itself. So once you’ve done that, you simply position the tile just about where you would expect it to go from a height position and then just nick the foam at that stage, just as reference. Then put the tile to one side and then what we want to do is trim this foam so that you basically have just enough left that when the tile sits on it, it compresses it by no more than sort of 5-10mm. So because of the way the tiles overlap, you’ll always be starting with more foam at the bottom and less at the top. So just simply run the knife along the foam until we reach the point where we trimmed earlier. And then because it’s not an exact science at this stage, a quick check by popping the tile back into place and you can see the foam has just sort of compressed a reasonable amount that we could actually work with that. With that in position, you can see the relationship between the tile positioning and this ridge here. So once the tiles are interlocked as you would expect at the base, you want this tile to sit. So ideally, it just comes into contact with this upright. The closest the tile can be is 30mm. So if you have a profile and the upwards sweep takes you over that ridge, that’s fine as long as there is still 30mm here to allow water to travel down this channel. And you can be as much as 60mm away from the window. 60mm basically is to the edge of this foam. So if the foam is visible, it means you’ve gone too far away from the window and you’ll have to consider bringing everything in a touch or it may just mean having to put a nasty little cut which wouldn’t be ideal. So now we just need to get our fixings, and fix this tile into position. So I’ll just fix our next tile into place, having trimmed the foam. So once you’ve completed tiling on this side, you would then just carry out the same process on the opposite side of the window. Trimming the foam and installing the tiles. Unfortunately, the chances are this side will have to have cut tiles. It’s very rare that you’ll manage to get a full tile either side of the window so it’s much better to try to position the window so that you can get a full tile on this side where all you’re having to do is take off one nib. The only cut then is just on this one single side, so it speeds up the process as much as we can, taking into account that you have to probably end up cutting tiles. Once we get to the top, we carry that principle across the top edge here, bearing in mind that we also have to factor in our tile support that you can see here. Don’t throw this away. This is what your tile course above the window is going to rest on. If you throw this away, it’s inevitable that the tiles will sag above the windows. So that could be slid into position to determine however large a tile cut you need to finish off across the top. The closest you can be is 60mm, furthest 150mm from the window to the bottom of the tile. So now just to complete the weather tightness of the installation, we need to reinstall the sash, bearing in mind we’ve got a lot less room to work with now because we’ve added all the cladding parts so we have to be a little bit more careful as we guide everything back into position. So as before, I’ve used the barrel bolt to secure this corner. Lean everything back in so I can guide that first hinge in place. Lift, both hands over here; push that out. Line the hinges up; little lift and we’re in. Undo the bolt, bring everything around. We’ll hear the clicks and everything is secure and we can close the window up.